La Aroma de Cuba premium cigars have been revived and brought back into the cigar world by renowned cigar-maker, Jose "Pepin" Garcia. Under the Ashton Cigar Company line, these hand-rolled premium cigars are produced by My Father Cigars in Estelí, Nicaragua. 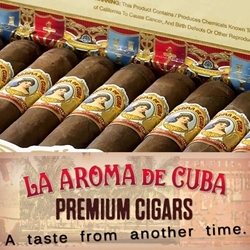 La Aroma de Cuba cigars are made up of the finest, aged Nicaraguan tobaccos and held together inside a silky smooth Connecticut Broadleaf wrapper. Each of these premium cigars are medium to full bodied, offering a satisfying smoking experience with deep flavors of earth and spice. Cigar enthusiasts who truly enjoy the great taste of a premium Nicaraguan cigar will stock up their humidors with these fine elegant smoking gems. We at Smokers Discounts believes you will too! La Aroma de Cuba cigars can be delivered right to your front doorstep! Smokers Discounts has made it easy and affordable to buy hand-rolled premium cigars. A variety of sizes and flavors are listed below in our online cigar store. Each of these styles are in stock and available for a low discount price! Call us for more details!